Soap scum consists of oils from soap and your body, paired with mineral deposits in your water. In a short amount of time, this builds up on a tub's surface as an ugly chalky residue. 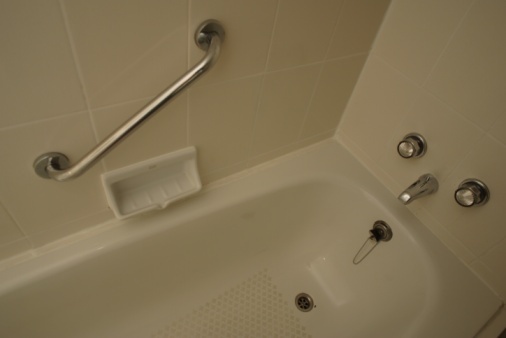 Soap scum can build up on any tub surface, including acrylic. When cleaning this from acrylic, however, you must use cleaning products and mild cleaners that will not harm this material. Put on rubber or vinyl cleaning gloves. Saturate a sponge with warm water from the tub faucet. Pour 1 tsp. of dish detergent (liquid) on the wet sponge. Scrub the entire bathtub (you may have to rinse out the sponge and re-apply dish detergent). The detergent will help loosen any oily residue in the soap scum, and the detergent may be the only cleaner required in mildly soiled tubs. Attack remaining soap scum with white vinegar, as recommended by JDS Bath Systems. Mix one part of white vinegar with one part of water in a cup or bowl. Wet a clean sponge in this mixture. Rub the sponge over the soap scum. The vinegar should start dissolving remaining scum almost immediately. Scrub it with the sponge and re-apply more vinegar as necessary. Rinse the tub with a clean damp sponge and then dry it with a soft towel. 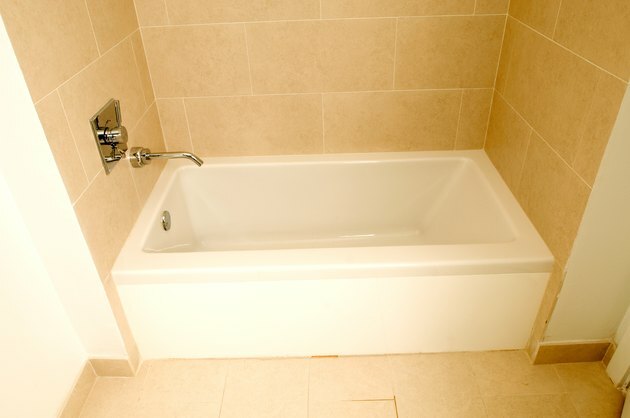 If you clean your tub this way at least once a week, you should be able to avoid heavy build-up of soap scum.